An interesting exercise for sure, and by and large, what the Primal Rock People wanted was ‘Tortured Tone’… not one of the album’s more deeply rockin’ moments, but certainly one of its most emotive, with a chorus that takes hold then refuses to budge. For singer, lyric & melody writer Mikee Goodman, ‘Tortured Tone’ has always been a pivotal piece, proving he can shine just as brightly on material on the more measured side of that played by his previous outfit, SikTh, and also giving him the chance to take full control of the accompanying visuals. Conceived, cast & directed by Mikee, this lovingly constructed clip provides a clear insight into what was going through his mind when he penned the lyrics, and the final edit – again, overseen by Mikee – is sure to become a talking point amongst fans of the project. Says Mikee: "I really wanted to bring the vibe of the song out in this video. And I believe this has been achieved. Which is something I am really pleased about, as this song means so much to me. Is such an emotional song. And is a real journey in itself. The sorrow in the actress' eyes was perfect. The scenery in this video was really important too. It has log cabins, woodland, seascapes, huge bright fields, rainy cobble stone hills and also a bit of stop frame animation. The most challenging part of this video was making it rain. I felt it was needed, for the feeling of the song, it was always in my mind. So I built my own rain machine. And it rained!" 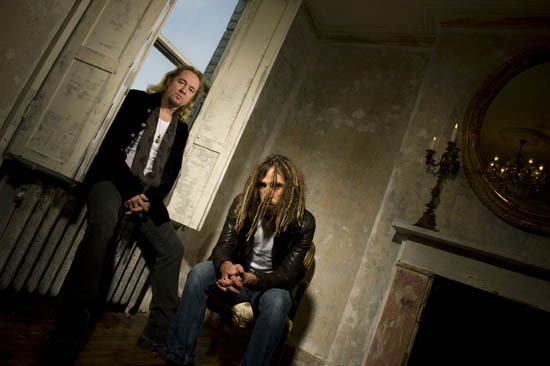 Produced by Smith & Goodman and mixed by Simon Hanhart, ‘No Friendly Neighbour’ is taken from the debut Primal Rock Rebellion album, ‘Awoken Broken’, released on February 27th 2012, also through Spinefarm. 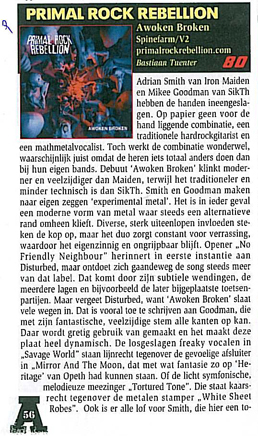 Nominated in the ‘Best New Band’ category at this year’s Metal Hammer ‘Golden Gods Awards’, Primal Rock Rebellion is clear proof that stepping outside of your comfort zone can reap spectacular rewards, with ‘No Friendly Neighbour’ the full-tilt result of two very different minds meeting somewhere in the middle! Says Goodman: “We actually shot the new video on the same day as the ‘No Place Like Home’ one, and it was a very intense experience. 'Awoken Broken' is out now! or get it on CD/vinyl from What Records. Digital version available from iTunes UK or iTunes US. 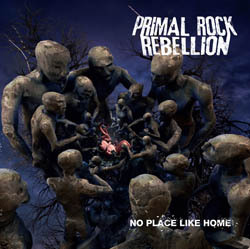 PRIMAL ROCK REBELLION released their debut single, ‘No Place Like Home’, via Spinefarm Records on Monday 6th February 2012. The single is available as a Limited Edition 10” coloured vinyl from What Records and digital download. The video has been co-directed by Mikee Goodman and Meats Meier, a renowned CGI artist based in Los Angeles who provided the illustrations for both the single and album artwork. VERY OFTEN, musicians -- especially established ones -- like to remain within their musical comfort zone, preferring to walk the tried an' tested path rather than breaking out in search of pastures new. Primal Rock Rebellion don't fit that bill. On the one side, there's Adrian, a key member of the Iron Maiden set-up, a band he first joined back in 1980; and since that time, Maiden has gone on to become one of the biggest hard rock bands the world has seen, playing to vast and staunchly committed crowds all over the world, opening exciting new doors in parts of the globe many people will never even have heard of! Their last studio album, 'The Final Frontier', hit the No 1 slot in over 28 countries! With Maiden's reputation having been forged through their ability to blend well-crafted vocal & guitar melodies with the sheer brute force of prime heavy metal, it will surely come as no surprise that the debut Primal Rock Rebellion album, 'Awoken Broken', delivers fully on both fronts, but with an extra nod to the underground, the alternative and the downright edgy -- an aspect of the music that is enhanced from start to finish by the presence of one-time SikTh frontman / lyric-writer / spoken word maestro, Mikee Goodman. With SikTh now universally lauded as one of the major inspirations of the new 'Djent' movement, it's perfect timing for Mikee to return to the music scene in full force, following that band's decision to take a break after their second 'Death Of A Dead Day' album back in 2006; Mikee's unique vocal approach -- an arresting, signature blend of spoken word plus a wide variety of vocal tones (some dark and disturbing, others that owe a debt to the world of animation) was very much a part of what made SikTh stand out from the chasing pack, and fans will be delighted to know that his key vocal mannerisms have been both retained and honed for Primal Rock Rebellion, in a form tightly bound to the structure of the songs themselves. Yes, there are spoken word elements, and yes, there are more extreme vocal moments peppered throughout the tracks, but generally speaking, this is a more mature and experienced Mikee, showcasing a strong, melodic voice plus an impressive vocal range, using the more 'adventurous' end of his repertoire as a way of providing contrast and effect. In essence, Primal Rock Rebellion is the meeting of different minds, different mentalities and different musical backgrounds, but the end result is very much a cohesive, self-produced whole... albeit one that reflects the individual talents of the musicians involved: Adrian provides the guitars, the bass and the advanced song-writing skills -- the sense of drama, of light and shade, of music designed to stir the senses, all of them. Adrian: "It was great working at my own pace and in my own studio with no time constraints. I think during the making of this album I went around the world twice with Maiden, working on the project in between. In the process, it allowed for a bit more of an experimental approach." Meanwhile, Mikee goes head to head with this renowned player as a full writing & production partner, adding new (sometimes surprising, often experimental) layers to the tracks, and ensuring that the music glistens with an inherent contemporary sheen. Mikee: "Adrian inspired me in many ways. I learnt the importance and the power of choruses in songs. Adrian also gave me a lot more belief in myself melodically. I think we pulled each other out of our comfort zones, creating something fresh and exciting along the way. We co-produced the album together, and the whole recording process was very relaxed -- no deadlines, just honing the songs naturally as we recorded them, a new experience for both of us." 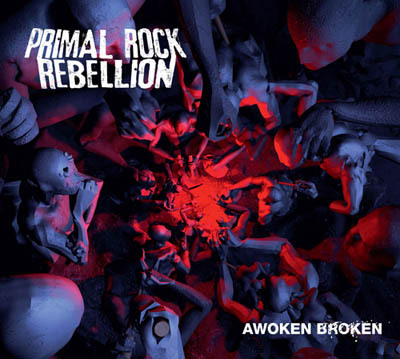 IN ADDITION to the Primal Rock Rebellion pair, there are backing vocals on three of the tracks (delivered by Tarin Kerry, discovered by Mikee while he was acting as producer for a band she was in), viola on the bulk of the songs (provided by Abi Fry of Bat For Lashes), plus original SikTh member Dan 'Loord' Foord on drums. Get the album Awoken Broken on CD from Play, HMV or Amazon UK or get it on CD/vinyl from What Records. Digital version available from iTunes. Awoken Broken will be release in the USA on April 17th, and can be pre-ordered from Amazon.